A friend of ours had a scary near-miss with a horse trailer yesterday. Driving down an interstate highway headed back home from a barrel race, she was suddenly shocked to see a car racing towards her truck at a high rate of speed…on the wrong side of the highway. Luckily there wasn’t a car in the next lane. She was able to swerve out of the way just in time. She said it seemed like the car barely missed hitting her horse trailer. Later it was reported that the highway was shut down to apprehend the driver, who at times was driving at an estimated 90 mph. Unfortunately no further details were available. Can you imagine? Things can happen so fast! For sure, no one was expecting a wrong-way driver on the interstate that day. I’m not sure what to take away from this as a learning experience other than to try to always pay attention to your surroundings and to always think of a way out, just in case. 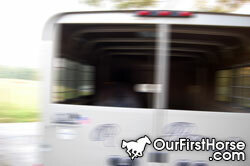 Have any harrowing horse hauling stories to share?